Life is growing increasingly hectic everyday and convenience is something that people value while they shop. Gone are the days when we had to visit the nearby malls & spend the entire day to get a thing of our choice. Online shopping has transformed our lives giving us the ability to shop at midnight from the comfort of our couch. However, spending hours browsing through multiple shopping sites for a pair of shoes or a last-minute present is a luxury of time only a few can afford. What about having a personal shopping assistant that can pick up matching outfits & create our favorite look? Not just that, it can help us to efficiently compare prices and get the best deal. Many luxury brands are offering personal shopping assistants as a complimentary service to let their customers just sit and relax while the assistant shops the items as per the clients’ fashion preferences. All this has been possible using technology rather than investing in a full-time employee. 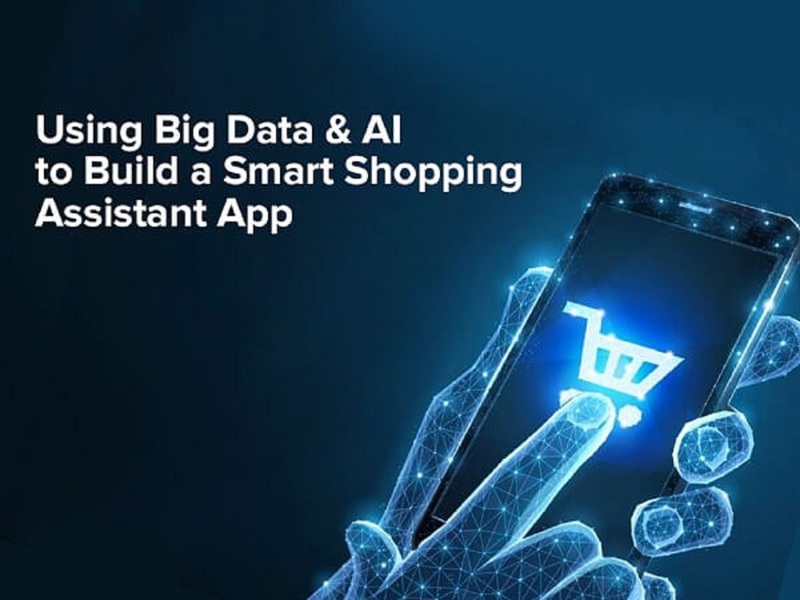 Today, we will find out how Big Data Services along with Artificial Intelligence (AI) can help in developing smart shopping assistant apps for exceptional user experience. Along with a strong search feature that provides more precise and accurate answers, the app must offer search suggestions as the query is still being typed. User satisfaction is directly proportional to the success of the app, which is why the app should come up with expert advice as per the client’s fashion choices. Behavior of the shoppers should be tracked to get information like product details, wish listed items, most visited section, etc. & most importantly, their decision-making process. Ensure that the app is free from distractions & irrelevant conversations to keep customers focused on the purchase & conversion goal. Images used for the products should be clear, optimized and compressed (to avoid slow load time) before uploading to help users evaluate the desired products easily. Even after making the purchase, the app should provide a strong customer service to users so that they can track the package and get queries resolved instantly. Years ago, the assistant apps are built with AI technologies along with real human support. However, apps can now learn using smart algorithms by analyzing human tips and offering the best shopping experience. Businesses are making use of virtual shopping assistants to acquire new users, enhance customer’s lifetime value (LTV) & reduce service costs by removing the need for redundant customer care support. Search Functionality should not only focus on keywords but also on recognizing synonyms & product relations. Another advantage is adding voice and image search option in search engines that will make it more convenient for users to search. Apps with the ability to analyze customer search behavior & buying preferences help in proving smart recommendations to users. Machine Learning has enabled users to get more relevant suggestions through cross-selling & upselling. Another advantage of AI in e-commerce marketing is analysis review that analyzes the content of reviews and extracts valuable information from page descriptions, which helps to reduce manpower, cut costs, and speed up warehouse operations. With AI-powered robots, delivery and support agents are being replaced to carry out tasks like products stacking on shelves, packing, shipping & delivering the package for the customers. Some companies are making use of AI in backend operations to build smart assistants like humans, shipments delivery using drones, robots for warehouse operations, etc. Well, who doesn’t love to shop? Especially, when you have your personal shopping assistant apps. With time, the trend of the assistant app will transform the big shopping brands and revolutionize the whole retail industry. With the aim to provide customers with a customized shopping experience, assistants need continuous learning from user interactions & ensure satisfaction by offering only the relevant products information. That is why, there will be a huge demand for Big Data Analytics Companies having experienced developers with a strong knowledge of Machine Learning, Big Data & Artificial Intelligence. Promote your brand & deliver experiences that meet your user’s expectation using a smart shopping assistant app.